After gushing about the Rocky Mountains for a couple weeks, I am finally back home, ready to tackle some new, local climbs. This weekend I will be heading back to the North Carolina high country, and will get the opportunity to explore part of a new state. August 18th was a tough weekend to decide on a ride. As it turns out, three rides that I have wanted to try are all happening on the same day. The Blue Ridge Breakaway was my ride of the year last year. It’s an amazing ride, and I had a blast participating last year. This year they are expanding the event to include a special event the night before with special guest, bloggers The Path Less Pedaled. A lot of people have asked me about this ride after listing it as the best last year. If you are on the fence, I encourage you to give this a try. I cannot make it this year, but it is already on next year’s calendar. Flight of the Dove is a local favorite. It is a metric century that takes place in Laurens County, SC. While it may not necessarily be my type of ride (brutal mountain centuries), it is extremely popular. Of my local club, about 20 are traveling to participate, a big number given that it’s a 1.5 hour drive. Everyone I know that has ‘Done the Dove’ has raved about it. As much as I like to ride with close friends, I have to skip this one. Instead, this week I am doing the Blue Ridge Brutal in Jefferson, NC. It has a reputation of being a tough century, which is right in my wheelhouse. Additionally, it is a new area for me. It isn’t far from Boone, NC, where I’ve ridden a few times. Aside from a stretch on the Blue Ridge Parkway, all of these climbs will be brand new to me. That was the deciding factor in my decision. I like climbing new hills. After finishing the 100-mile century, some riders have the option to ride up Mount Jefferson, a 3-mile climb with a steep grade. I am officially on the waiting list. From what I understand, a lot of people change their mind after 100 miles. That is understandable, but it won’t be me. We’ll be staying an extra night, returning Sunday. Assuming the legs are in decent shape the next morning, we’re going to venture across the Virginia border. I’ll try a climb or two while my wife explores the area. Most likely I’ll ride up Grayson Highlands, the highest paved road in Virginia with a good view of Mount Rogers, the highest point in Virginia. 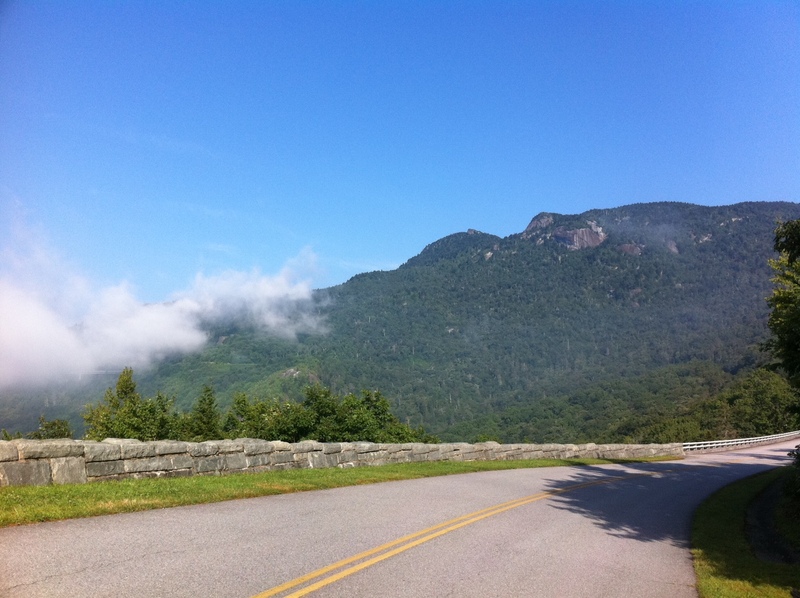 This entry was posted on Tuesday, August 14th, 2012 at 9:14 pm	and tagged with adventure, biking, blue ridge breakaway, blue ridge brutal, boone, climbing, cycling, flight of the dove, jefferson, mountains and posted in Blog. You can follow any responses to this entry through the RSS 2.0 feed. Welcome back. I’m sure you had an amazing trip. Tonight, my daughter Sarah and I ventured out on a 10 mile ride together. The insight of an 11 year-old girl is beyond amazing. We talked, we laughed, we rode…we bonded. It was a beautiful experience. When I was younger (and by that I mean 13) all I wanted to do was to go faster and harder; always trying to push the limits of what I could do. Now here I am with a daughter just a couple of years away from the age when I started racing and I see things though her eyes now. It’s okay to stop and smell the flowers along the way…or pick up a bird’s feather. Keep on riding. We’ll keep on reading. Great comment, Andrew. Thanks for sharing the experience. While I don’t have the 11-year old daughter, I can appreciate and understand the sentiment. For me it is mostly about enjoying the scenery first, and proving anything to myself or others second. At least until Mitchell, which is when I’ll start charging ahead again. Sounds like a challenge. Good luck, and stay safe. Thanks, Jim. These are always challenging and rewarding at the same time. Good luck my friend, I’ve got a century on Sunday. Alas no mountains to climb in southeastern Michigan. Good luck! I hear there are some good hills up in northern Michigan, but I guess that’s probably a ways from you. Northern Michigan is quite spectacular but you’re right – it’s a 6-8 hour drive to get up there. However, just 3-4 hours north will get me to where the good rollers start – specifically Gaylord, MI. My wife and I acquired an acre of property up there and we’re working on getting it prepped for a home we can retire in… There are plenty of hills to climb – though they are hills, but the roads are absolutely fantastic – 5′ shoulders covering hundreds of miles. It’ll be a bike mecca one day. Nice plan. Sounds like some great riding! One day I’ll be up north to ride Watersmeet Park. Not sure exactly where that is, but I believe it is far northern Michigan by the lake. Yeah, that’s up there (right next to Wisconsin). To give you an idea, it would only take me 2 hours longer to get to Asheville, NC… Watersmeet is a 9-1/2 hour drive from my place. This sounds tough and at the same time great! I wish I lived near there ( I am in Japan so I have to go over the Pacific Ocean to attend this. Well, the distance is not so much problem, the money to overcome the distance is the problem. If I could ride one the water 🙂 ). I am interested in climbing right now, climbing sounds great to me! Though I am not sure whether I will like to climb after the tough 100-mile ride. Good luck!! Hey there, thanks for stopping by. It is nice here, but I’ll bet the climbs in Japan are amazing! I seem to remember someone taking a tour of Shikoku and taking some remarkable pictures. Maybe I will make it out there someday.